Next up we have another popular titanium Bering men’s watch. This is a lightweight analogue watch with a clear and easy to read display. There’s a useful date indicator found at the 6 o’clock position on the dial and I rather like the use of the red coloured seconds hands. 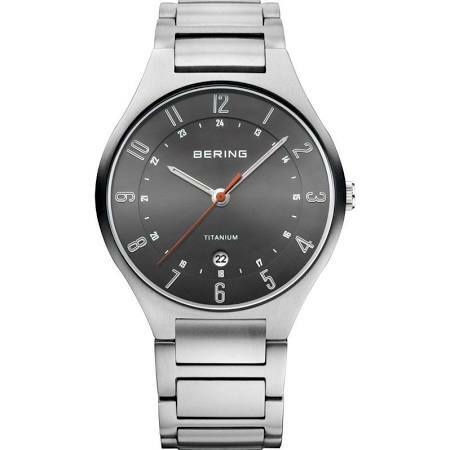 Just like the previous Bering watch, this timepiece features a slim design with a casing depth of just 8mm. I’m impressed with the use of a sapphire crystal glass in this price range, this gives you a very good level of scratch resistance. Powering this Bering titanium watch is a Japanese built quartz movement for reliable timekeeping.